A new feature called "Battles," designed to increase user and viewer engagement, has investors optimistic about the company's strategic progress -- here's why. Shares of Meet Group (NASDAQ:MEET), a collection of mobile social entertainment applications designed to foster human connection and interaction, including apps such as MeetMe and LOVOO, are up 12% as of 12:00 PM EST after the company updated investors on recent strategic progress. A key component to Meet Group's update Tuesday was regarding the new "Battles" feature on the apps MeetMe and Skout. Essentially, Battles pairs two livestreamers and their respective audiences for a live competition that can be in anything from dancing to music to comedy. The Battles last only a few minutes, and the winner is determined by the number of diamonds received from viewer gifts. We are always seeking novel ways to deliver meaningful connections. We believe Battles will enable connection around talent. We believe it also has the potential to incent viewers to give more gifts to streamers, which is primarily how we monetize video today. We believe the competitive dynamic will strengthen the relationships between streamers and their fans. 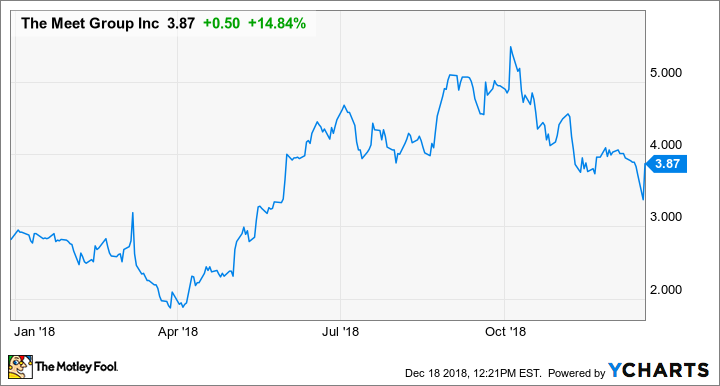 While this might not seem like a major deal to many investors, Battles could end up being an important driver for the company's revenue run rate, which exceeded $62 million annualized based on November, up from the $55 million mark during October. The past weekend checked in as the company's highest video revenue day in Meet Group's history. Beyond Battles, management also has a number of features that it hopes will increase video monetization, including the "12 Days of Gifting" holiday campaign. As the company continues to improve its ability to monetize video through unique features and campaigns, it's clear investors are optimistic about financial results going forward.